Who Owns Thomas Jefferson's Grave? that's worthy of a final examination in wills. First, some background on this. In a post over at Oxford University Press' blog about access to Jefferson's grave, I wrote, following a New York Times story, that the cemetery is owned by some of Jefferson's heirs. In a comment to the post, the current president of the Monticello Association (which manages the cemetery) says, the cemetery's owned by all of Jefferson's descendants. ("The Graveyard is not owned by SOME of the descendants of Thomas Jefferson, but by ALL of the descendants of Thomas Jefferson.") The truth of that turns on a couple of things, apparently, including whether the issue of Sally Hemings are also the issue of Thomas Jefferson. And it also turns on a reservation of the graveyard way back in the 1830s when Monticello was sold out by Jefferson's family. So let's look a little more deeply at this puzzle. Apparently the last recorded reference to the cemetery in a deed was when Monticello was sold in the 1830s. At that point, the family of Thomas Jefferson Randolph reserved the cemetery: "The parties reserve to themselves the family graveyard with free access to the same." Nice! This is an explicit reservation of what is an implied right of access in Virginia and a bunch of other states, too. There is also an explicit reservation of the title to the cemetery. Thomas Jefferson Randolph died October 8, 1875, and was buried in the little plot laid out a hundred and two years before, and where there now existed nearly fifty graves. In his will, dated January 24, 1875, he made a number of specific bequests of silver, portraits, and certain items which had belonged to Mr. Jefferson, and then he provided carefully and explicitly for his unmarried and widowed daughters in his bequest to them of Edgehill and of its adjoining lands. However, he made no mention of the Monticello graveyard, which he had inherited from his mother. Thus it became the undivided property of all heirs, and so it remains. This divided ownership contributed in part to the difficulties faced by the family within a few years, when Congress responded to the increasing public concern about the deplorable conditions at Monticello. The Monticello Association--a 501(c)(3) association--is currently managing the gravesite. So I'm curious what their relationship to the cemetery is. Have all the heirs given them the authority to manage the graveyard? I'm guessing that there may be a deed to the Jefferson descendants somewhere and that the Association is the representative of the descendants. But what happens when other putative descendants (like the issue of Jefferson and Hemings) appear? They wouldn't take as heirs of T.J. Randolph (and presumably wouldn't have the right to be buried in the cemetery); but they still have the right to visit the cemetery under the Virginia cemetery access statute. Makes for some mighty interesting questions in cemetery law. But then a google led to this story from the New York Times in 1911, which alludes to another grant. 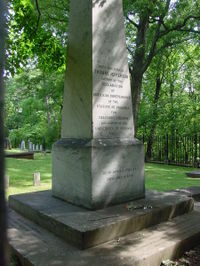 The public domain image of Thomas Jefferson's grave is from wikipedia.